NURSERY RHYME SHADOW MATCHING - Shadow matching games help children notice a specific element of a picture. Usually children notice the colour of objects. Visual discrimination skills will help children when learning to identify numbers, shapes and letters, since the distinguishing feature will be formation, not colour. 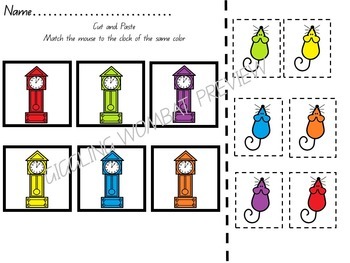 12 NURSERY RHYME PUZZLES – Colorful clock puzzles. 1 O’Clock – 12 O’Clock. 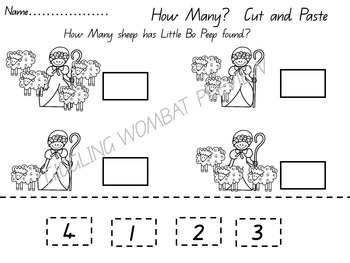 22 NURSERY RHYME CLIP CARDS – Number recognition 1-10. Syllable and Beginning sounds. Use with clothespins. 8 EMERGENT READER – Nursery Rhyme themed readers. Baa Baa, Black Sheep, Hickory Dickory Dock, Hey Diddle Diddle, Humpty Dumpty, Jack and Jill, Little Bo Peep, Little Boy Blue and Little Miss Muffett. Assemble, read and color these fun little books. 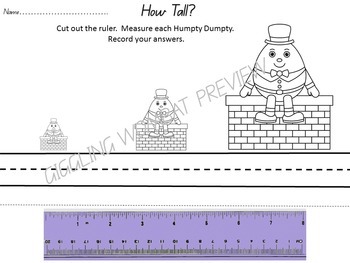 2 NURSERY RHYME THEMED GAMES – “Humpty Dumpty Shape Matching Game” (shapes). “The Clock Struck One” (Color recognition game). 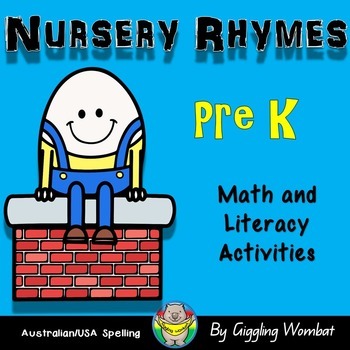 33 NO-PREP NURSERY RHYME PRINTABLE WORKSHEETS (fine motor activities)- Use these printable worksheets as morning work or independent work throughout the day. Patterns, tracing, scissor skills, letter “s”, “c”, “ h”, “j”and “m”, cut and paste, color, roll cover and color, left and right, labelling, matching, and measurement.